One of the main outcomes of the Rio+20 Conference was the agreement by member States to launch a process to develop a set of Sustainable Development Goals (SDGs), which will build upon the Millennium Development Goals and converge with the post-2015 development agenda. The world is behind schedule for meeting almost all of the goals. The financial, human, and natural resources are simply not sufficient to address the world’s enormous challenges through incremental solutions that follow our existing pathways. The Collective Leadership Institute is a cutting-edge organization with deep expertise in bringing emerging paradigm leadership concepts to multi-stakeholder processes and projects in support of achieving the Sustainable Development Goals. This work is vitally important to the long-term flourishing of humanity, as well as serving the preservation of life and its beauty on planet earth. Click here for more information about SDG 17. 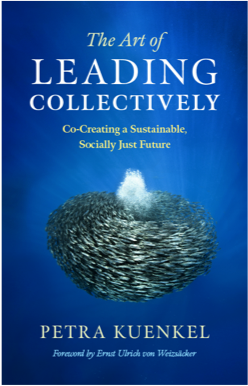 Collective Leadership is essential to change the world towards more sustainability, more human thinking, a better distribution of resources and efforts. Because we share a planet, we share humanity, we share a mutual benefit in a smaller world. Because solutions cannot be found in isolation and the challenges cannot be tackled by solitary action. Because dealing with the challenges requires the combined efforts of governments, private sector companies, and civil society. The Collective Leadership Institute responds with the vision to empower people to lead collectively towards a sustainable future and the mission to support, build competence, and invigorate networks for responsible business, people-oriented public service, and a strong civil society. In New York the world leaders met at a U.N. Summit to formally adopt the Agenda for Sustainable Development, with a set of 17 global Sustainable Development Goals (SDGs) succeeding the Millennium Development Goals and set the global agenda until 2030. The core intention is to eradicate extreme poverty for all people everywhere, currently measured as people living on less than $1.25 a day. From experience we all know that setting goals is one thing – and commendable when they are agreed on at this global scale. However, the most important question was not answered: How to implement the agreed Goals? The pathway is clear: a go-it-alone-strategy is outdated and implementing the SDG’S is only possible in collaboration. We need multi-stakeholder partnerships (MAPs) between the private sector, public sector, and the civil societies at scale.